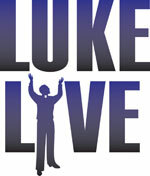 Luke Live embodies an “organic” approach to Scripture that views the Bible as a legacy of reflected experience that requires continual dialogue with contemporary experiences and insights to make it a truly “Living Word.” Thus, the performance of Luke include segments of reflection and dialogue with the assembly. Luke Live affirms the Bible’s full revelation comes through its totality–not individual passages–thereby witnessing to the Divine dynamic of “process.” Furthermore, the optional 4th Mission Night includes an overview of “Four Stages of Faith Development in the Bible” adapted from The Great Themes of Scripture Old Testament (By Scripture Scholar Franciscan Father Richard Rohr and Joseph Martos Cincinnati, Ohio: St. Anthony Messenger Press. 1987, rev.1999. Luke Live creates a visceral experience of the Gospel so that its audience more readily makes connections between biblical dynamics and their personal and communal life experiences of God. Fr. DiLuzio proclaims segments dramatically, pauses for meditations that also include hymns and secular songs to savor dynamics and feeling evoked from the passages. In addition, Fr. 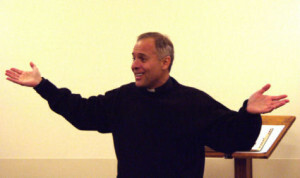 DiLuzio inserts homilies throughout to guide the participants through the more difficult and challenging sections. Fr. DiLuzio would love to hear from you! Please feel free to connect with him on your favorite social media sites using the icons above.